With non-surgical skin tightening, cosmetic surgeons can effectively tighten moderately lax or "crepey" skin on the face, neck and body, helping patients improve their appearance and postpone the need for surgery. In general, non-surgical skin tightening procedures work by using targeted energy to heat deeper layers of skin, which stimulates collagen and elastin production and gradually improves skin tone and texture. Some treatments also affect fibrous tissue to help smooth cellulite. There are numerous FDA cleared skin tightening treatments and technologies on the market; each uses a unique mechanism to achieve the desired result. 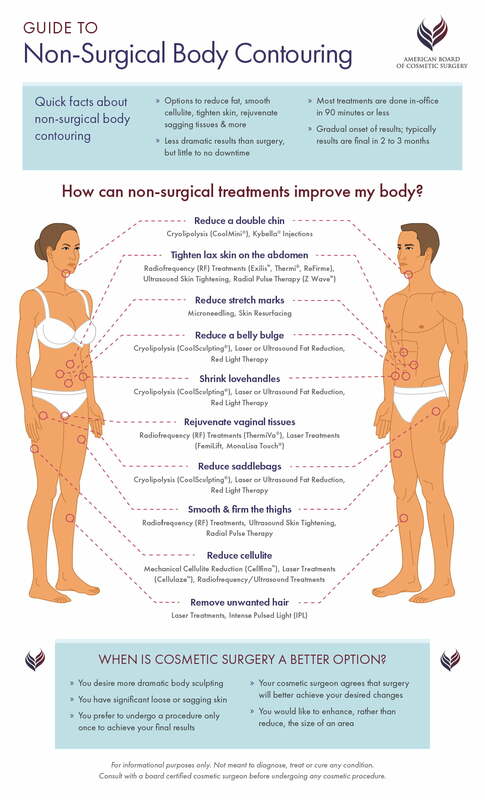 Our guide below will he,p you learn more about non-surgical skin tightening and your various options. While there are very few serious side effects associated with non-surgical skin tightening, it may not be appropriate for patients who are pregnant, taking certain medications, or have certain medical conditions. The best way to find out if non-surgical skin tightening is right for you is to consult with an experienced cosmetic surgeon. Start by finding surgeons in your area who are certified by the American Board of Cosmetic Surgery (ABCS). Diplomates of the ABCS have undergone extensive training in surgical and non-surgical cosmetic treatments, and can help you choose the best option for your needs and goals. Outlined below are the most common FDA cleared technologies available in the U.S. In general, completely non-invasive skin-tightening treatments can be safely performed by a licensed, trained aesthetician or registered nurse working under physician supervision. Subdermal treatments that require an incision, such as THERMI RF, should be performed only by a qualified cosmetic surgeon or provider with equivalent training and experience. The best place to start? Schedule a consultation with an experienced cosmetic surgeon near you to discuss your needs and goals, review your treatment options, and learn how non-surgical skin tightening can help you feel more confident in your appearance.